A few months ago, just for fun, I decided to enter the Guess competition "One to Watch", aimed at finding bloggers from all around the world that could write in the official blog of Guess Access. Well, I'm happy to announce you that I've been selected as one of two bloggers who will represent Italy! I do not know how to express my excitement and happiness for this totally unexpected victory ... it is priceless to gain recognition for my own work and daily commitment! And of course, what would be a winner without any award? Here the pictures of the wonderful surprises that I received from Guess! 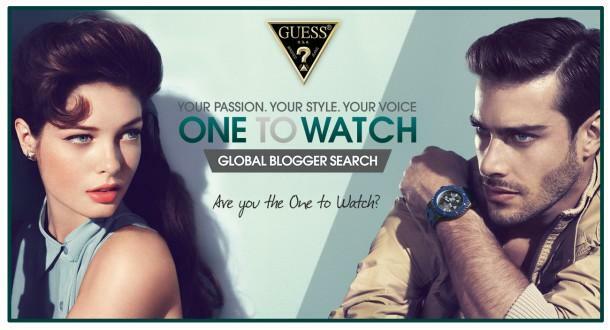 Qualche mese fa, per gioco, ho deciso di partecipare al concorso Guess "One to Watch" per la ricerca di blogger da tutto il mondo che potessero scrivere nel blog ufficiale di Guess Access. Ebbene, sono felice di annunciarvi di essere stata scelta come una delle due blogger che rappresenteranno l'Italia! Non so come esprimere a parole la mia emozione e la felicità per questa vittoria assolutamente inaspettata... ottenere riconoscimento per il proprio lavoro ed il proprio impegno quotidiano non ha prezzo! E ovviamente, che sarebbe un vincitore senza qualche premio? Ecco a voi le foto delle meravigliose sorprese che mi sono state inviate da Guess! What will be inside this lovely pouch? This watch is stunning, isn't it? I really needed a new cosmetic bag! such a beautiful and elegant watch- looks like the perfect addition to any outfit, and the bag it come in is amazing- you will never forget to put it safely away. Congrats!! so exciting for U!! simply to die for the watch! all the best for more! congrats....u go gurl..ur goodies are soo pretty!! Complimenti! Sono molto contenta per te! Baci!!! waow.. congrats.. you deserve for it.. it is the result of your hardworks.. congrats..
Congratulations! The watch is beautiful! I'm following you in GFC. COULD YOU PLEASE BACK? Nice! Congratz on the watch. Grazie per essere passata nel mio blog! Thanks for your visit! I follow you hope you follow me back. wow complimenti!! i premi che ti hanno inviato sono stupendi!! :) Baci! And btw, GORGEOUS watch they gave you! Hey Elisa! congratulations for the win!! Gorgeous watch, love it. Congrats! Big congrats to you dear! What a real opportunity . . . I'm following you now, I hope you can do the same! The watch is gorgeous, I love it! I am already following you by GFC, but Thank You for your comment in my blog dear! of course i follow you,hope you follow me back.kisses! Congratulations beautiful lady! You deserve. That is so cool!!! congratulations!!!! Hi Sunshine, I was following via Bloglovin, but now also following via google. Hey! Beautiful blog. Thanks for dropping by mine and commenting. I'm following you now. I'd love it if you can follow me back! Thanks, doll! Gorgeous watch! You deserve it my dear!